Ridge Racer DS is an arcade drift racer and one of the first racing games to come out on the Nintendo DS. Can it still keep players on the edge of their seats after all this time? Ridge Racer DS (or Riiiiiiiiidge RACER! as the announcer likes to call it) is one of many Ridge Racer games that have appeared over the years. The first game launched in the arcades, riding the last great wave of the coin-op industry, then screeched onto the original Playstation as a launch title. Ridge Racer and its various sequels then came out on a huge variety of platforms, including Nintendo 64, Playstation's 2 and 3, the Xbox 360 and of course the DS. The chase camera is the best way to play Ridge Racer. Anyone who disagrees is simply bonkers and wrong, so there. Firing up Ridge Racer DS, everything seems familiar to fans of the series. The presentation is good and the game opens with an exciting looking intro movie and yes, the game has an over enthusiastic commentator/announcer. As a fan of the series, I immediately felt at home. This is Ridge Racer DS alright, though strangely, series mascot Reiko has been swapped for a girl who looks more like she belongs in Need for Speed. So, if you've somehow missed Ridge Racer in its various incarnations, I'll give you a rundown on the basics. You drive a very fast car and are placed at the back of the grid. There are 12 computer controlled cars ahead of you that are somewhat slower. You have 3 laps of a circuit in order to catch them and finish first. The cars handle a little differently from many other driving games. Usually, there's no need to apply the break for cornering. Instead, you lift your finger from the accelerator and turn in sharply. The car will then start to slide. Unlike a real-life power slide these cars can be controlled during their sideways skidding by simply dabbing on a little counter-steer. 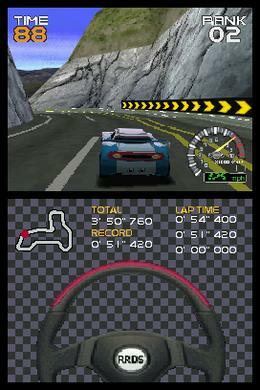 In Ridge Racer DS the technique is harder to master than on other versions of the game, but not as unforgiving as it was on the original Playstation version. From the main menu, DS players can choose Quick Race, Single Player and Multiplayer. Quick race throws you straight into the action on the basic Ridge Racer course. Single player mode is where the bulk of the game is. In this mode you complete various Grand Prix challenges in order to win trophies. There are three races in each stage and several different difficulties. Diving into the first race on novice, new drivers are likely to be initially frustrated at the difficulty of handling the cars. The steering is quite sensitive and it is very easy to over-compensate. Collision detection isn't always perfect, drifting is more tricky than in some of the newer Ridge Racer titles and even series veterans will be caught out in some corners. Luckily, as with all other Ridge Racer games, your car is totally indestructible. The game is also quite forgiving of all but the hardest of shunts into the scenery and in spite of bumping and crashing my way around the first couple of courses, I was still able to win easily. Once a Grand Prix has been completed, you can play Car Attack mode. Here, instead of being put up against a field of 12 cars, you race just one car that is faster than your average computer controlled drone. If you beat it, you get that car to keep and use in future races. This way you can win faster cars for tackling the later stages.